A few years back I sometimes cycled to and from work and I'd hit a quarter mile long tunnel next to a canal about 3 miles from home. The Tunnel has no lighting and is reputed to be haunted. What is clear is the atmosphere in the tunnel really does something to the human body and imagination even if it's not haunted. You feel like there are other people around, other creatures moving in the dark even on the other side of the canal where the footpath is closed to the public. That's not to say there aren't. It would be more odd if rats, water voles and other small mammals didn't call this tunnel home but it adds to an overall feeling of not quite knowing what's in the dark. Once I even bumped into another cyclist pushing their bike the other way because of the way sound moves in the tunnel we didn't become aware of each other until almost together in the middle. It's very odd. Around the same time I was at a conference and saw how games had started to be used in medicine to reduce the amount of pain relief used. One game, a snowy scene with snow ball fights, was being used in burns wards with great success in lowering the pain felt by patients. Another was developed by a teenage cancer sufferer where they symbolically 'killed' the cancer while undergoing painful treatment that had met with good response from other users. With VR it seems you can take people to another place. A happier place. At first I wanted to create something positive, something that made the player feel better about themselves but then I looked at the deadline and the amount of time I have available and had to choose an easier emotion to tape into. The one of the fear that comes with uncertainty. VR does fear very, very well because it's an unreal world and the mind is more ready to accept negative emotions than positive ones. 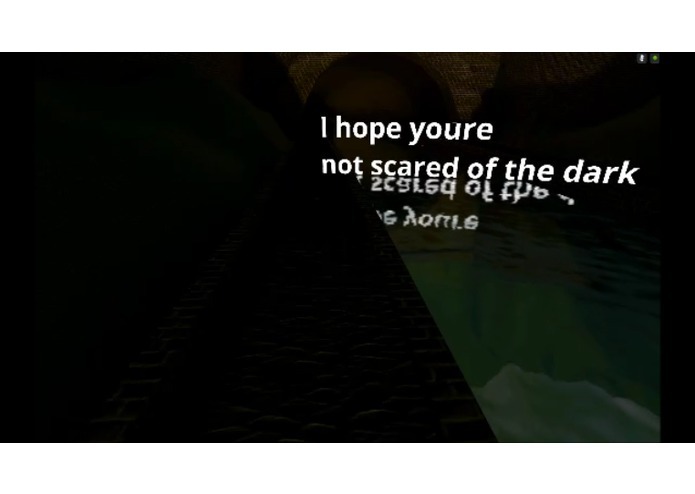 So I used the inspiration that came from seeing how well VR can elicit strong emotional responses combined with the uneasy feeling of being only a few hundred feet from being able to look up and see the sky in the tunnel by the canal to try and recreate that feeling of being there, somewhere slightly odd but so close to early evening skies and birdsong. It will allow the user to undertake the short journey down a tunnel with a body of water to one side. Home is at one end, not getting home in time for an evening meal with the family is the other. The dark, the damp, the way you have to walk with your head bowed so you don't crack your skull open and the way sound travels in odd ways make the entire journey a little unnerving. Who knows what might be hiding in the shadows. From even before the compo started I knew what my main problem would be. Time. I work full-time, spend two hours commuting and have disabled children that rely on me in the evenings and weekends. At very best I can afford to put 40 hours into the project and that's if all the stars align and I'm awake enough when I'm free to put time in. In other words I'm probably going to have a similar amount of time to work on this project that a younger person can spend on a Ludum Dare Jam. At the two week mark I'm most proud of the fact it runs at 60fps and the 3D audio is really coming together. If I win a Vive I'm going to use this as a stepping stone to create a series of experiences including a couple of relaxing games with autistic friendly audio/visuals. Solo project. Did the entire thing in ~40 hours. Long Time Dev - mostly games in the last 10 years. Fixed a couple of issues with the grammar on the start menu and updated the binary to the fat type that supports x86 as well. Uploaded what is probably going to be the final release for the Jam. In total I've spent 38 hours on the project due to family and work commitments over the three weeks I was aware the jam was taking place. It's been a pleasure to develop my first VR experience and right now I want to take the half dozen or so VR experiences and games and turn them into something rather special. I've got Aspergers and have two kids (with vastly different ages) also with Aspergers and I down when they are having difficulties among the other VR projects I'd like to complete. What went right? Well the immersiveness feels really good to me but it is lost a little thanks to glitches in models and lighting (hey I never claimed to be an artist). I'm really impressed with that side of things. Very simple models, lighting and audio come together and the brain starts to accept them really quickly. What went wrong? Well I picked this project because it's easier to make somebody feel 'odd' than it is to feel 'good' in goggles and will be until people get used to them. What isn't easy is crossing the uncanny valley and trying to do a realistic scene at 60fps with multiple cameras on a mobile phone. That goes double when water needs to look and act like mucky water. If I had to pick another VR title to do in 40 or so hours I'd have gone abstract. Maybe next time. Added an APK for testing purposes if anybody is interested. It's dark, sparse and feels damp and spooky as planned. Runs really well on my Wiley Fox Phone and Nvidia Shield Tablet but your mileage may vary. Not going to make the deadline for uploading to the Play Store but thankfully the organisers seem to understand that not everyone has an account or can find the time and will be accepting APK's uploaded to this site. Right now I'm doing the final lightmapping so no modelling after today. If I manage to find an extra hour to do the minimum number of graphics and stuff for the Play Store tonight I'll submit the APK there as well as putting it a link on this site. Got 45 mins today (half of which was spent fixing issues between different Unity versions) but managed a bit of a menu/tutorial and finished off the minimal viable product splash screen. Forgot to sync my local git at home with bitbucket so I didn't have access to the current version of the game at lunchtime yesterday so I modeled a quick joystick model to use as a splash screen in the 30 mins I had available. Only managed 20 mins at home last night so I pulled the splash in to the game. The expected crunch at work has been put back so I should get another 5-10 hours this week. It's looking like my total hours in this project is going to be about 30 and I'm pretty impressed by what I've got. Uploaded the first video. It's not really shot in the cardboard as I used the built in capture from my nvidia Shield to grab the video and it doesn't fit in the device. I'll grab some better video when there is something more to see. A few recent commit messages so you can get a gist of what's been happening. ie. Not a lot :) Had about 5-6 hours to work on it in lunchtimes and a little in the evenings. Apart from last night because I commited and pushed the wrong repo at lunchtime I couldn't work directly on the game in front of the tv despite having managed to find an extra hour to do some work. Day 1.5 The extra time I can find sometimes during my lunch hour that is. Made the lighting a lot more moody and attached a point light to the player controller so you get the right sort of night vision where you can clearly make out stuff near by but unless it's damp and rim lighted you can't make out stuff far away. Got a tunnel section so I can look at lighting and things later and when my cardboard gets delivered (hopefully today) I can start looking at what level of detail and effects it's possible to use on various android devices to get a feel for what I should be aiming at. First bit of actual work done today. Managed to find 30 mins at lunchtime to add a short section of canal in unity to test the scale and lighting.